Formed in 2010, L.A. indie rock band The Americans have accomplished a lot in four years. They’ve crisscrossed the country, performing with such artists as T Bone Burnett, Patti Smith and Grammy and Oscar winner Ryan Bingham on his “Junky Star” and “Tomorrowland” tours. The band’s current tour features a stop at High Dive in Seattle. 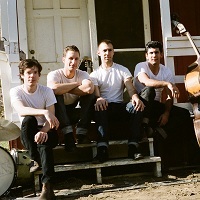 Featuring Patrick Ferris (vocals, guitar), Zac Sokolow (electric guitar, banjo), Jake Faulkner (bass) and Tim Carr (drums), the rootsy rock band recorded the song “Sweet & Low” for the 2013 ANTI- Records album, “Sons of Rogue’s Gallery,” featuring music by Keith Richards, Macy Gray, Tom Waits and Dr. John. The album was executive-produced by Johnny Depp. The Americans also had the honor of performing at the wedding of Reese Witherspoon and Jim Toth, playing Bob Dylan’s “Make You Feel My Love” during the newlyweds’ first dance. The band performs with indie rockers Metaphoria and Basement Baby at 8 p.m. Sunday, Oct. 5, at High Dive in Seattle. Tickets are $6. Read more about The Americans on their official website here.